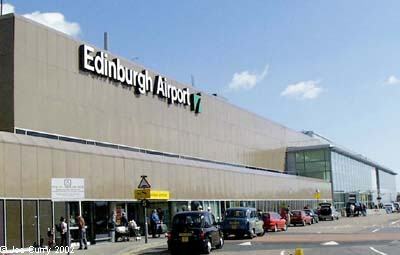 Scroll down for Edinburgh Airport - Edinburgh City Centre transfer information or click here! Edinburgh is a popular tourist destination and for good reason! A bustling metropolis, Edinburgh is a university city filled with youth and vigour. There are hundreds of young, innovative businesses started in Edinburgh every year and tourism also adds to the city`s wealth. There`s also a lot to see and do. There are art galleries, theatres, privately owned cinemas, gigs and festivals. There are excellent restaurants and there`s a bubbling night life. The city is modern with a strong, Scottish backbone and is best described as intelligent, enterprising and proud. Leith, the port of Edinburgh still has a separate identity to the city proper and is a place of outstanding natural beauty; peaceful and enjoyable on warm summer days and moody winter nights. Cruise liners dock at Leith, taking on passengers and visiting far flung lands such as Norway, Sweden and Germany. Aer Lingus, Air Canada Rouge, Air France, Atlantic Airways, BH Air, British Airways, Brussels Airlines, Delta, easyJet, Edelweiss, Ethiad, Eurowings, Finnair, Flybe, Iberia Express, Inghams, Jet2com, KLM, Lufthansa, Norwegian, Qatar, Ryanair, SAS, Thomson Holidays, Transavia, Turkish Airlines, United Airlines, Vueling, WOW. Abu Dhabi, Alicante, Amsterdam, Antalya, Athens, Barcelona, Basel, Belfast City, Belfast International, Bergerac, Berlin Schoenefeld, Beziers, Birmingham, Bodrum, Bologna, Bordeaux, Bourgas, Bratislava, Bremen, Bristol, Brussels, Brussels (Charleroi), Budapest, Cancun, Cardiff, Chambery, Chicago O'Hare, Cologne (Bonn), Copenhagen, Corfu, Cork, Dalaman, Doha, Dublin, Dubrovnik, Dusseldorf (Weeze), East Midlands, Exeter, Faro, Faroe Islands, Frankfurt (Hahn), Frankfurt (Main), Fuerteventura, Funchal, Gdansk, Geneva, Gothenburg, Gran Canaria, Grenoble, Hamburg, Helsinki, Heraklion, Ibiza, Innsbruck, Ireland West (Knock), Istanbul, Jersey, Kaunas, Kefalonia,Kirkwall, Krakow, Lanzarote, Larnaca, Lisbon, Liverpool, London City, London Luton, London Gatwick, London Heathrow, London Stansted, Lyon, Madrid, Malaga, Malta, Manchester, Marseilles, Menorca, Milan (Malpensa), Munich, Murcia, Naples, Newquay, New York (JFK), New York (Newark), Nice, Norwich, Orlando, Oslo, Oslo (Rygge), Palma, Paphos, Paris (CDG), Paris (Orly), Pisa, Poitiers, Poznan, Prague, Pula, Reus, Reykjavik (Keflavik), Rhodes, Rome (Ciampino), Rome (Fiumicino), Salzburg, Santander, Shannon, Southampton, Stockholm (Arlanda), Stornoway, Stuttgart, Sumburgh,Tenerife (South), Toronto, Venice, Verona,Vienna, Warsaw Modlin, Wick, Zante, Zurich. As well as all these airlines, you could choose to fly to another Scottish airport in the west coast and travel across. If that sounds like fun, the national rail services in Scotland make for easy travel. You can find out more regarding Scottish train times and plot your journey using the National Rail Website. If you do choose to get to Edinburgh via Edinburgh Airport you`ll be pleased to know that there is a host of services on offer. There`s a Bureaux de Change, ATMs and a post box. There`s also Wi-Fi internet access but this isn`t free, so you must pay to use it. unlike that when you arrive at the Valentine City Centre Guest House which is free for all guests. There are numerous coffee shops and places to grab food throughout the airport (The Cornish pasties served from the VW Camper are outstanding!) along with two bars for a pint of beer or glass of wine. You can also shop in Edinburgh airport because there are plenty of outlets which can provide tax and duty free savings to those leaving the EU. For those who wish to pray there`s even a non-denominational prayer/quiet room. Some UK passengers choose to fly to Edinburgh despite being close enough to visit by train. Birmingham to Edinburgh flights might seem extravagant. However, UK travellers should compare flights and train travel thoroughly, because sometimes flights are more relaxing and direct. Edinburgh's airport lies just seven miles to the west of the City Centre. Unless you are picking up a hire car, the transport options are buses or taxi, there is also a tram service but it does not connect well to local services, and the express bus is cheaper and quicker! Transport is well sign-posted from within the terminal. Travelling from Edinburgh Airport to the Valentine City Centre Guesthouse is simple, you have three main choices. 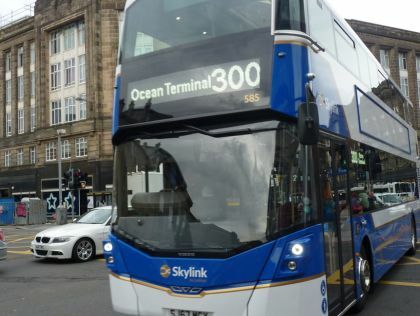 Lothian Buses Skylink service 300 for £4.50 single £7.50 return per person will transport you from the Airport terminal to less than 200m from us. This takes around 50 minutes and is a good choice unless you have very heavy luggage without wheels, or are in a hurry! Change is given. The Valentine is one of very few guest houses which are close to the route of this service. The relevant bus stop and walking route to our door are shown on the map on the main Directions page, but you want the first Lauriston Place bus stop (named "High Riggs") after turning left at the Tollcross clock (the bus stop AFTER the one outside Raging Bull / opposite 'Superdrug', but the stop BEFORE Novotel). 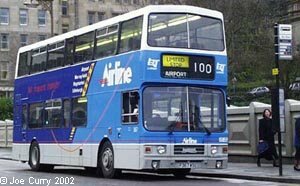 The 300 Skylink turning into Lauriston Place at Tollcross Junction, when you see Lothian House on your right as shown behind the bus - this stop!! A taxi will transport you and your luggage direct to our door for between £17 and £20 dependent upon traffic, number of passengers and the amount of luggage. 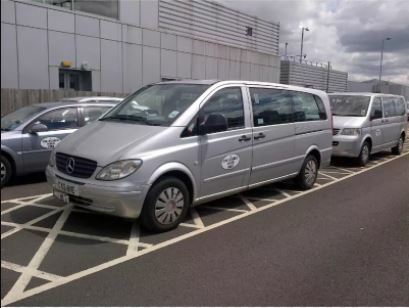 We recommend the private hire cars (shown in picture) rather than the more expensive 'black cabs' from the airport (Note that fares to areas such as Mayfield and Newington are further away and therefore more expensive to reach by taxi, we benefit from being on the airport side of the city centre). This is of course the most expensive option for one person, though certainly worth it if there are three or four of you, or if you are struggling with heavy luggage. Journey time depends on the time of day, but 30 minutes is typical. For more than three people this is the cheapest option. Note that the bus stop for both the Lothian Buses 10 and 27 is DIRECTLY at our door, with other connecting services very close by (around 50M). The choice is yours from these options, if you have any problems simply call us! 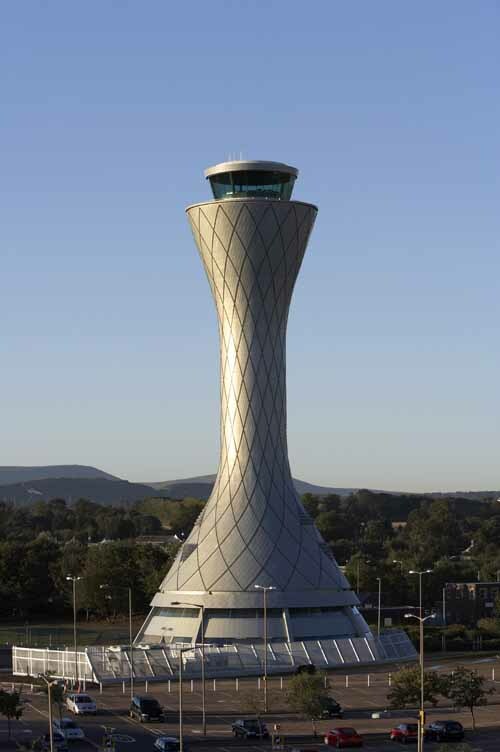 The award winning new control tower at Edinburgh Airport.